1+2 Architecture were commissioned to convert a disused shopfront and warehouse into the new head office for Stornoway, a Tasmanian company that design, build and maintain civil infrastructure. The outcome is a contemporary workplace that positively impacts the working life and well-being of employees and promotes workplace integration, communication and innovation. A diverse palette of basic, raw, recycled and cost effective materials has been selected and assembled to exude warmth and comfort, while maintaining the required level of formality. Most evident is the use of C-D grade plywood for walls and perforated ceilings and the repurposing of flooring timbers salvaged from within the existing buildings as a glazing partitioning and screening system. New glazed composite timber facades flood the interior with daylight and natural ventilation, ultimately creating a highly cost effective, sustainable building, enriched by the benefits of innovative and thoughtful timber construction. Stornoway are serious about the ethos of their work practices. This is reflected in many aspects of their organisation from the environmental impacts of their construction work to the structure and management systems of their business. It was important to them that this ethos was reflected in the design of their new work environment. The use of timber was central to the delivery of this as it enabled an innovative and sustainable approach. A primary decision was to recycle the pre-existing building. Timber framing sourced from the demolition of mezzanine floors within the building were repurposed to form a bespoke partitioning system. Low grade plywood was perforated and used for acoustic ceiling linings. This, combined with acoustic recycled PET and plywood panelling has contributed to a quiet and calm work environment flooded with natural light enhanced by the warmth of timber. Tasmanian Eucalypt hardwood has been used to structure the new external glazed façade. The intricate structures are built in composite with an aluminium glazing adaptor. The timbers have been left rough sawn on their long faces and dressed on their internal short faces providing textural variation and refinement at small scale. 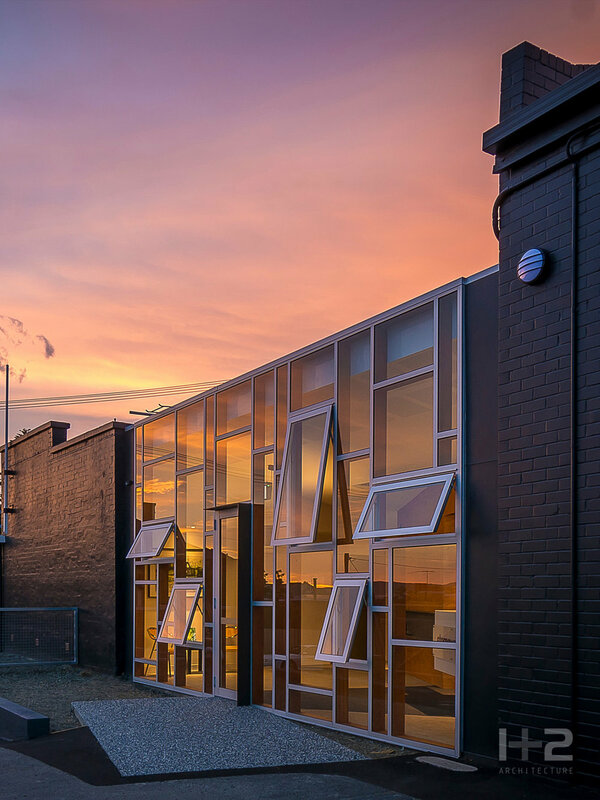 "[This project is a] successful example of adaptive re-use, a clever, simple and considered solution that has met the brief for a workspace that promotes integration, communication and innovation." "The commercial fitout for Stornoway, a Tasmanian company that designs, builds, and maintains civil infrastructure, is a successful example of adaptive reuse. It makes use of an existing shopfront and warehouse with the intervention of a linking reception. This glazed link is a complementary contrast between the two heavy brick buildings and makes use of repurposed timber from the site. The entry has been relocated from street frontage to side – a clever solution to create a shared reception for public and trade. This, along with simple and considered planning has met the client’s brief of a workspace that promotes integration, communication, and innovation." "The architects were commissioned to convert an existing shopfront and warehouse into the office of Stornoway. The brief consisted of providing a space that enhanced health and wellbeing, while promoting innovation and communication. A refined palette of recycled raw timber, plywood, and acoustic panelling brings warmth to the industrial space. Materials have been carefully selected, based on their environmental credentials, simplicity, rawness, and cost effectiveness. The insertion of roof lights creates an environment filled with natural light. 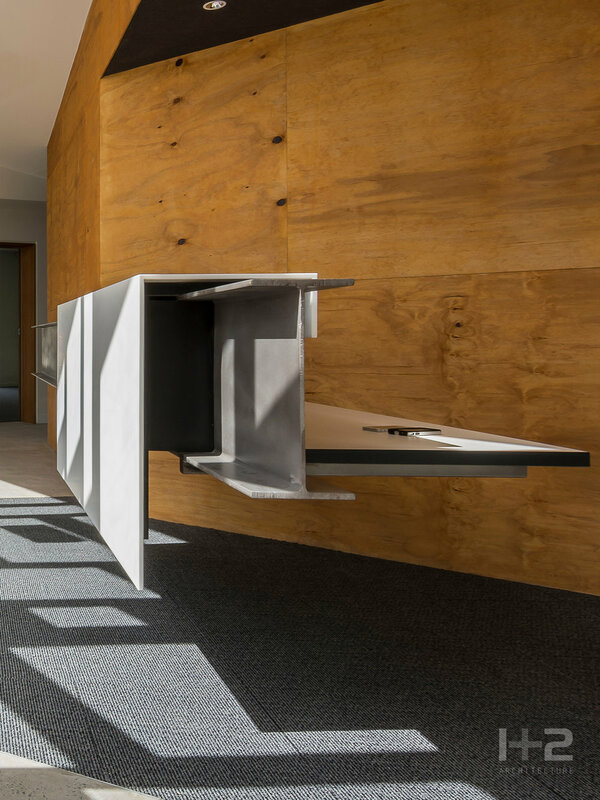 The combination of natural light and ventilation, clever acoustic solutions, and raw natural materials works to create a harmonious and contemporary workplace."